Coverage: Live BBC coverage on TV, radio and online. 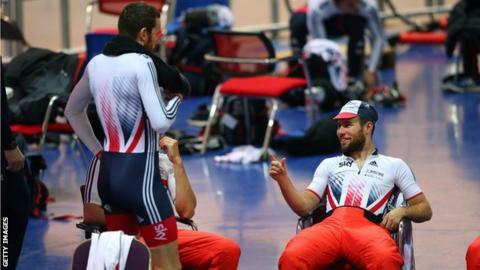 Mark Cavendish must finish in the omnium top three at the Track Cycling World Championships to have a chance of competing at the Olympics, says British Cycling technical chief Shane Sutton. The 30-year-old has not won Olympic gold, having fallen short at the 2008 and 2012 Games. He hopes to compete in the multi-event omnium in Rio. "If he can't make the top three, he would pursue his dreams of the Tour de France yellow jersey," said Sutton. "I believe he can do it, we wouldn't have selected him otherwise. That's not us being brutal, that's Cav being Cav, probably the greatest road sprinter of all time. He needs to know he can go to Rio and get the medal." Cavendish has had a successful road season to date, having won the Tour of Qatar. He is aiming to compete at the Tour de France, although men's endurance coach Heiko Salzwedel believes the Isle of Man rider will have to prioritise. "If you ask me realistically, riding for two or three weeks on the Tour de France, he might be fit for the [Olympic] road race but not for the Olympic omnium," he said. Cavendish will also compete in the madison - a non-Olympic event - with Sir Bradley Wiggins at the World Championships, being held in London early next month. They combined to win the title eight years ago.